The Waterproof Bible from Bardin & Marsee is available in a variety of translations and styles, all available here. The review copy seen here is the NKJV Waterproof Bible with imitation leather slipcover, available for $64.95. The dimensions are 5 7/8" x 8 3/4", and the weight is 2 lb 7 oz., with 8 pt. type. The layout is a reproduction of a Nelson outreach edition. You open your Bible to the table of contents. At the bottom of the page, you find printed instructions. 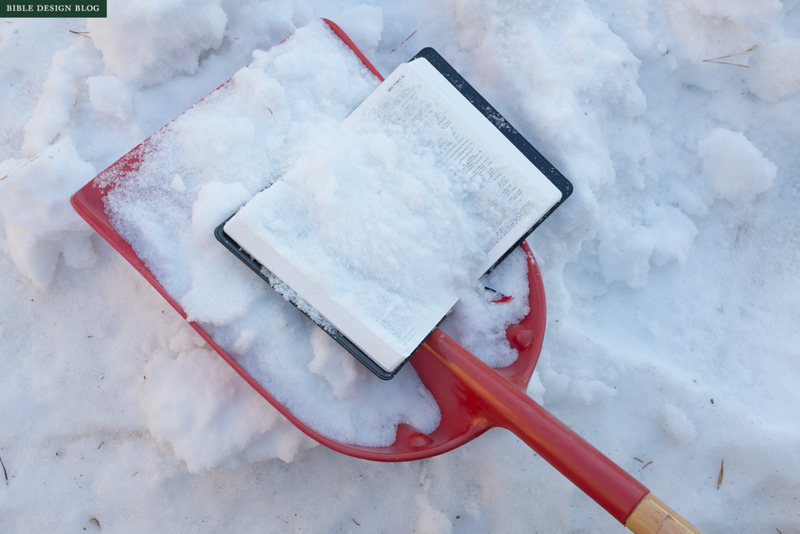 If your Bible freezes, you must let it thaw before opening. When wet, dry it with a towel and it will be good as new. Outside your window, the ground is blanketed in snow. The windchill is pushing the temperature below zero. The question is, what are you going to do? What are you going to do? If you’re me, the answer is simple. You’re gonna go outside with a shovel and bury it in the snow. I warned Bobby Bardin something like this would happen. Bobby is the founder of Bardin & Marsee, the publisher of the Waterproof Bible. He was in town last autumn, so we got together for coffee to chat about his experiences publishing one of the most unusual editions of Scripture on the market. When I floated the idea of testing the Waterproof Bible in the brutal, unforgiving winter conditions of South Dakota, he just smiled. Bobby is too nice a guy to issue any do-your-worst challenges, but he seemed pretty confident of the outcome. All right, I thought. Game on. For the Waterproof Bible, Bardin & Marsee licenses Melcher Media’s DuraBook™ format, printing on 100% plastic pages. This gives the book extraordinary resilience against the elements, and imparts an extra benefit: because the pages do not absorb ink, the print is black as onyx and razor sharp. The opacity of the page is impressive, too. If you hate that five o’clock shadow effect many Bibles suffer from as a result of the printing on one side of the page showing through to the other, the Waterproof Bible is impressive. “What, this Bible?” I asked, pretending to stumble. The Waterproof Bible dove edge-first into a snowbank. While Laurie gasped, I shoveled some snow over it. Then I dug it up again, opened the book, and shoveled snow onto the pages. The Waterproof Bible uses YUPO synthetic paper, which Bobby estimates at 61-62 gsm, roughly twice the thickness of most of the editions I’ve written about recently, which tend to run in the 30s. In addition to being waterproof, it is smooth, tear-resistant, and tree-free. But how would it perform if you accidentally buried your Bible in a snowdrift and forgot about it? That remained to be seen. Because of the paper, there are some trade-offs. One of them is minor, the other pretty significant. First, you won’t be able to use fountain pens, rollerballs, pretty much anything that lays down a nice wet line of ink. The paper won’t absorb it. So you’ll have to content yourself with ballpoints, pencils, and dry highlighters, assuming you write in your Bible at all. The other downside is that the Waterproof Bible is large, thick, and heavy — at least, it feels that way relative to the type size. The type is this edition is approximately 7-8 pt., arranged in a traditional double-column setting. While sharp edges and a dark print impression make the words more readable than they otherwise would be, this is still small … especially given the proportions of the book. Compare the layout of the Cambridge Clarion. The type size is in the same range, but the single column setting and overall design make it more enjoyable and much more compact, even though the Clarion isn’t exactly tiny. Where the Clarion cannot compete, though, is page opacity and sharpness of print. And if you forget your Clarion in the snow, well, all bets are off. My original plan was to leave the Waterproof Bible buried until spring, but I’m too impatient for that. After giving it a chance to get nice and frosty, I dug it up none too gently. Thanks to chunks of ice between the pages, I could not close the book, so I struck it against a railing and gave it some hard shakes. That didn’t do the trick, so I brought the Waterproof Bible in the kitchen and put it under the tap. I gave the book a nice long spray, then used a towel to dry it off. Fanning the pages helped me identify the ones still stuck together from the damp. The Waterproof Bible was still a bit damp when I was done, so I left it to air dry. How much damage did the ordeal inflict? Let’s put it this way. Looking at the Waterproof Bible now, I cannot tell that it’s ever gone outside. Before and after, the Waterproof Bible appears pristine. The text setting in this particular book comes from a Nelson NKJV outreach edition, a genre of layout the puts a great emphasis on economy of space. Bobby Bardin explained that using a layout like this helped trim the bulk a bit. A single column text setting with larger type, nice as that might be, would expand the girth considerably. Perhaps a Waterproof single column New Testament might represent a good middle ground? (There are some Waterproof NTs in the line-up, but not paragraphed single columns yet.) We had a nice chat about all the possibilities, and I’m looking forward to seeing what Bardin & Marsee attempts in the future. One of the things that impressed me talking with Bobby is how open he is to innovation. That shouldn’t be surprising, given the whole waterproof thing, but still. They’ve produced a line of spiral notebooks using the same waterproof paper. And they’ve beat me to the punch on one of the items on my secret checklist should I ever get the opportunity to produce my own edition. The Bible in these photos has a camouflage cover, which is really not my thing — it can survive being lost in the woods, but good look finding it! You would never know it, though, because of the black polyurethane leather-like slipcover. (They also have brown and burgundy covers available.) My Seven Seas journal rides in a skirting leather slipcover that has aged beautifully over the years. Imagine a Bible designed to be compatible with covers like that! While the Waterproof Bible might not find its way into the pack of an ultralight hiker, I can imagine a lot of outdoor contexts where a resilient edition like this would be worth the trade-offs. And here’s another setting where it would shine: the crowded coffee shop table of the ministry professional. I see them everywhere these days, and always wonder how many of the e-mails I get asking about how to remove coffee stains from Bible paper originate in these scenarios. The Waterproof Bible doesn’t mind if you spill your mocha on Sunday’s text. It wipes clean and no one’s the wiser.